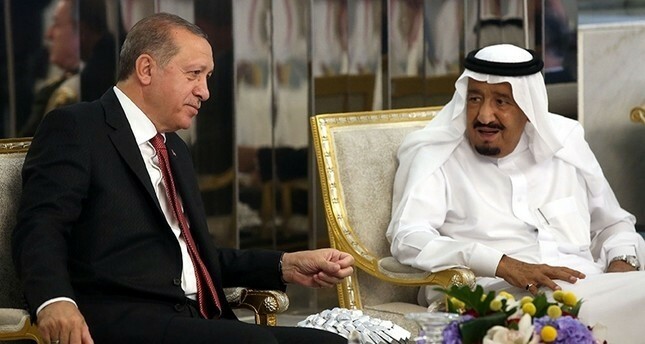 Saudi King Salman called President Recep Tayyip Erdoğan, thanking him for the recently formed joint Turkish-Saudi working group to investigate the disappearance of journalist Jamal Khashoggi, who is feared to have been murdered by a team of Saudi agents in the kingdom's Istanbul consulate. Salman also affirmed the kingdom's "solid" ties with Turkey, saying no one could undermine the relationship between the two countries, the Saudi foreign ministry said. The joint team will investigate the disappearance of Khashoggi upon the kingdom's request, Presidential Aide Ibrahim Kalın said last week. Kalın told Anadolu Agency,"Within the framework of a close cooperation between Turkey and the Kingdom of Saudi Arabia and upon the suggestion of the kingdom, a joint working team between Turkey and Saudi Arabia will be formed to investigate the case of Jamal in all its aspects." Later on, State Department Spokesperson Heather Nauert said that the United States is "content with Turkey-Saudi agreement to form joint working group to investigate Khashoggi case." On Tuesday, Turkish Foreign Ministry spokesman Hami Aksoy said Saudi authorities notified Ankara that they were "open to cooperation" and would allow the consulate building to be searched. On Monday, President Recep Tayyip Erdoğan urged the Saudi Consulate to prove whether or not Khashoggi exited the building after entering, saying the consulate officials "can't get away with (simply) saying 'he left the building'." Turkish police investigating the case said in a statement Saturday that 15 Saudis, including several officials, arrived in Istanbul on two planes and entered the consulate while Khashoggi was inside. On Tuesday, footage and identities of the "assassination" squad were made public. U.S. President Donald Trump said Thursday that Washington was working with Ankara and Riyadh on the investigation, though Turkish officials denied his claim that U.S. investigators were operating inside Turkey. Khashoggi had been living in self-imposed exile in the U.S. since last year.